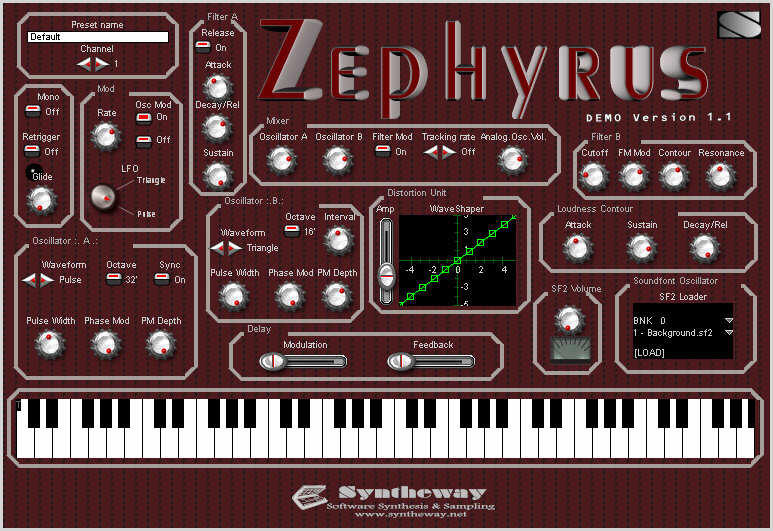 Syntheway Zephyrus is a Hybrid Synthesizer that combines an analog synthesis engine and SoundFont oscillator to produce complex pads and background sounds.Soundfont Oscillator: The SFO Uses the raw samples in a SoundFont file (*.SF2) as waveforms. Samples can be arranged into Banks, Patches, Key and Velocity zones. 2 Digitally Controlled Oscillator - DCO - with 3 selectable waveforms (Saw, Triangle, Pulse) have knobs to control the octave. Hybrid Synthesizer that combines an analog synthesis and a SoundFont oscillator. - 2 Digitally Controlled Filter - DCF - A) with control over cutoff, contour amount, FM mod and emphasis. B) with control over ADSR envelope generator (Attack, Decay, Sustain, Release). - 1 Mixer, controlling oscillators A & B, master volume, Filter mod and Tracking rate. - Loudness Contour with control over ADSR (Attack, Decay, Sustain, Release). - Distortion Unit (Waveshaper): A wave distortion effect which maps input to output values using flexible spline-based graph. # PORTAMENTO/GLIDE control: affects pitch transitions. A gliding effect that allows a sound to change pitch at a gradual rate, rather than abruptly, when a new key is pressed or MIDI note sent. - Delay Effect Built-in: with Modulation (Varies the delay time dynamically- 0 to 10V ) and Amount of Feedback controls. Qweas is providing links to Zephyrus VSTi 1.1 as a courtesy, and makes no representations regarding Zephyrus VSTi or any other applications or any information related thereto. Any questions, complaints or claims regarding this application Zephyrus VSTi 1.1 must be directed to the appropriate software vendor. You may click the publisher link of Zephyrus VSTi on the top of this page to get more details about the vendor.